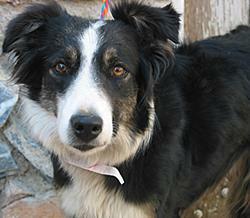 Molly is an extremely sweet young adult female tri-color border collie that BCIN bailed from a local shelter this week. 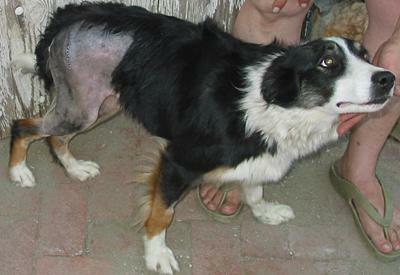 It was immediately apparent that she requires veterinary care as she can not put any weight on her right back leg. She had lacerations on both her back legs that were sutured by the shelter vet, but no X-Rays were taken. Most likely, Molly was hit by a car. Shelter personnel and volunteers took an instant liking to Molly, for even though she was in quite a bit of pain, her very sweet personality never waivered. BCIN was contacted on her behalf and after meeting her, we refused to turn our back on her, and welcomed her into our rescue program with open arms. It has been confirmed by our veterinarians at High Desert Veterinary Care in Victorville, that Molly will require a surgery called Femoral Head Ostectomy (FHO). In this surgery, the ball portion of the hip joint (the femoral head) is removed and the bone smoothed, if necessary, so that no bone to bone contact occurs between the pelvis, which contains the now empty socket and the remaining portion of the femur. Molly is a very special dog worth saving. Our volunteers have never seen such a beautiful and loving soul despite the obvious pain that she is in. Her prognosis for a full recovery is excellent. 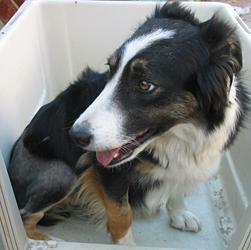 FHO surgery is quite expensive, however BCIN is committed to obtain the necessary veterinary care that Molly requires. We are a young rescue, incorporated in September 2007, and experiencing all of the usual financial struggles of a neophyte organization. We are sending this plea out to you for donations to help offset the cost of Molly's surgery and to support the rescue work we have dedicated our lives to in making a difference, to end dog homelessness and suffering. Molly came through her surgery yesterday with flying colors, and there were no complications. She was very needy on the ride home, insisting on touching me or me touching her the whole way. I had to stop and reposition it for her as she was uncomfortable. The leg was pretty floppy, but it had been floppy before the surgery, as well. This morning she is up and about on the patio, and her leg is hanging much better. It will take her some time to realize she can use it again, as she hasn't used it for some time. FHO recovery is really very simple. Keep the dog from running amuck and give it time to heal. Molly is not high drive, so this has been easy. She sets that foot down when she jumps up for cuddles and as she was standing on my foot the other day, I could detect the amount of weight she is putting on the leg and was pleased. She is still carrying it when she is walking, though it hangs better each day. It only seems to get floppy now when she sits down too quickly. 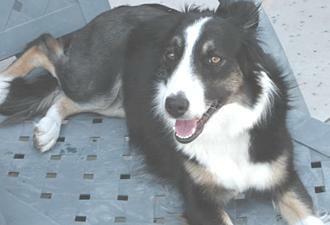 Molly gets her staples removed this Friday and we will hear what the Dr. has to say about her recovery. I don't expect any surprises and think she is right on track for a week post-surgery. She has been so good at not licking or pulling at the staples, although she is itchy where she was shaved. The new hair growth must be prickly to her as it is to people. Miss Molly is such a gem and has been a wonderful patient. When she is ready for adoption, someone is going to be very lucky to have her. She has been a great asset in working with Hope, the little feral pup. I will miss her sweet nature very much when the time comes to say “so long”. Wonderful news for Molly! Her veterinarian has said she is recovering from her surgery and now it is just a matter of giving her time to heal. Last night Kathy took her home, where she will receive Kathy's loving attention for a week (she already reports Molly is a "sweet, sweet lover girl"), after which she will move to a new foster home. Two of her benefactors, real rescue angels, have offered to foster Molly and provide needed rehabilitation. While there, Molly will receive gentle therapy in the form of short, slow walks to strengthen her leg, and positive reinforcement to show her that she can now place weight on it. Alternately, she will also receive brief pool therapy sessions in order to strengthen her muscles in a non weight-bearing environment. We're so happy that Molly will be whole again and life is finally looking up for this truly lovely little girl. Yesterday I felt we did move forward. I was on my own with her all morning and I introduced her to the swimming pool - yes, she can swim! She seemed to like it and after her swim she was running around back and forth to me. I had to calm her down because I do not want her to damage her leg, but she was like a rejuvenated dog! She is putting quite a bit of weight on the leg from time to time, but lifts it when she has to make a "fast get a way!" In the afternoon there was a huge test for her as our two sons, wife and girlfriend plus their Cocker Spaniel came for dinner to celebrate my husband's birthday. Molly did so well. She got on really well with Jasper (who was really gentle with her) and the boys just got down to her level, spoke and stroked her. She didn't run away, but stayed in her safe place, they even got a wagging tail. I am pleased she has found this space as she seems really comfortable there. Wonderful news for Molly! Today she found her forever home with a very nice family who are enthralled with her. 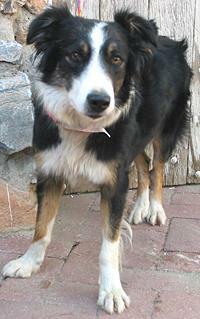 We wish the very best for this girl, and will update with photos when her new family is able to provide them. Way to go, Molly!! 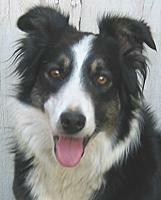 Copyright © 2008 Border Collies In Need, Inc. All Rights Reserved.